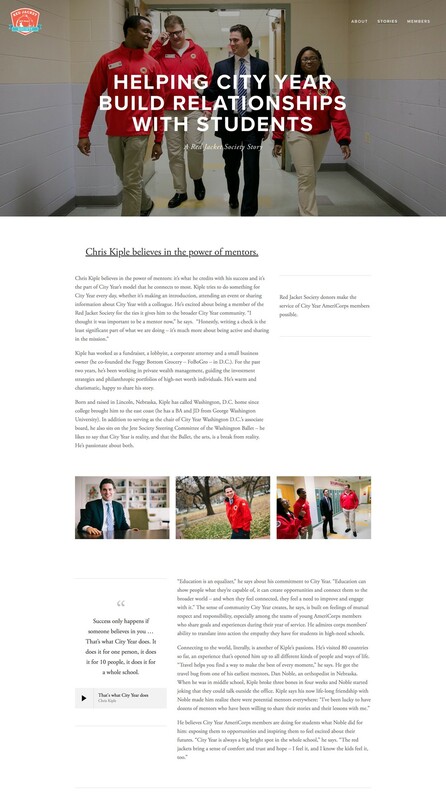 The Red Jacket Society website serves as a platform to engage a community of $10,000+ donors to City Year. Each year, it spotlights specific donors and the impact of their support through media-rich, immersive articles. For many non-profits, describing exactly what each dollar of your donation will do can be as difficult to articulate as it is valuable to the donor experience. We needed a way to provide these top donors with an engaging, informative, and modern experience. Pictures and words: we sent both a writer and a photographer out to interview the donor and their community, and take high quality, directed photos for each article. Platform: After assessing a number of platforms, we ultimately landed on Squarespace due to its modern templates and simple UI, allowing us to focus less time on layouts and more time on crafting narratives. I was responsible for researching platforms, determining the navigation and templates, and laying out the copy and media for each article.